At Everlast our professional team of roofing experts have experience in the significant range of Rooflights that are available on today’s market. Daylight is an important natural resource, which can significantly improve the internal environment of a building and reduce energy costs by reducing the need for internal lighting. 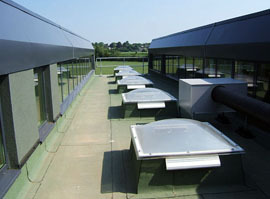 Rooflights are easily incorporated within a roof and include site assembled double and triple skin rooflights, factory assembled composite rooflights and dome rooflights. The versatile nature of rooflights means the desired amount of daylight is easily achieved without compromise to the building’s safety, design and character.